In recent years, with the rising demand of sand and gravel aggregate the application of sand making equipment has been wider and wider. sand maker is often used in cement production line, sand and gravel aggregate production line, and other fields, and the main quick-wear parts as rotor and impact plate’s consumption also has been increased. Sand maker has a long history in China, and has achieved quite good breakthrough by many domestic manufacturers’ continuous innovation and improvement. Along with the developing of our country's science and technology, domestic industrial development environment has become superior. This is one of the reasons that Chinese machine manufacturing industry has been in rapid development. Shanghai Shunky is a sand maker manufacture, its products include VSI sand maker, impact crusher, 6S new sand maker and so on. 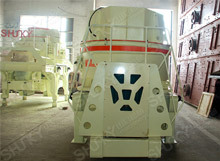 Shunky choose good quality parts on sand maker so that they can have a long service life and much more wear-resisting. Shunky attaches great importance to international technical exchanges and cooperation, it has introduced advanced technology from the United States, Germany and Australia, and its products are exported to many countries and has gotten customers praise.